I love potato salad. It is full of potatoes – which I adore, and usually mayo – which is also delicious. I eat potato salad in all it’s iterations too: fully loaded, mustardy and eggy, german with bacon, etc. But sometimes they can get a little heavy and overly complicated with indistinct, muddy flavors. This recipe is great because it’s simple and fresh tasting without being boring at all. In fact it’s rather punchy in the flavor department. 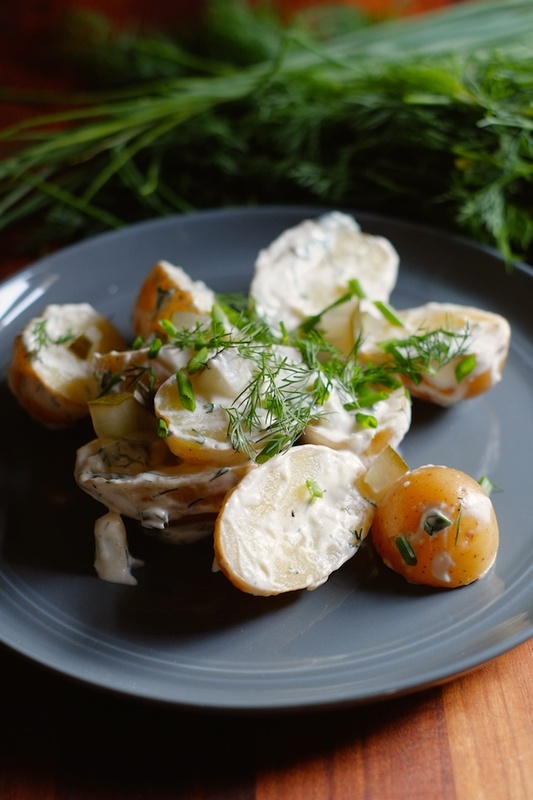 To keep the flavors clean and the texture interesting, I chose to highlight dill pickles with baby yukon gold potatoes. The rest of my ingredients are there support and compliment the main players. You could use whatever potatoes you like with this same dressing, but I really like the texture of baby yukon gold potatoes and the way they hold themselves together when they’re cooked. Nothing mushy or muddy happening in this salad at all – it’s fresh, summery, rich and bright all at once. 1. Wash potatoes and remove any weird eyes or grassy stem pieces. Put potatoes in a pot, cover with cold, salted water and allow to come to a boil slowly (over medium to medium-high heat). Cook potatoes until a knife inserted into a potato will slide back out without sticking at all. 2. 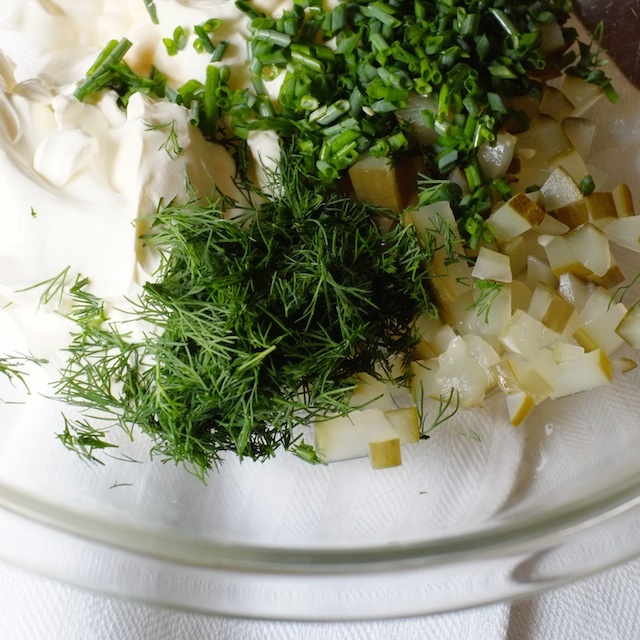 While potatoes cook, make dressing by whisking together your favorite mayo, sour cream and pickles. Add pickle juice, garlic, dill, chives, salt, and pepper. Taste the dressing and add more salt or pickle juice if necessary. The dressing should be pretty strong – remember it has to give flavor to the potatoes which don’t have a lot going on by themselves. 3. 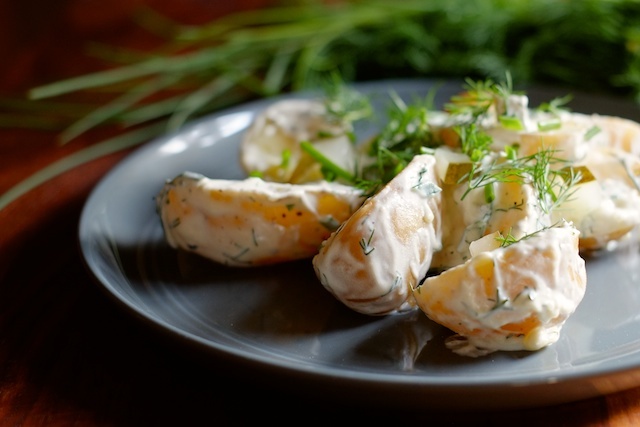 Once the potatoes are done cooking, allow them to cool slightly and cut them into bite-sized pieces (if your potatoes are very small you may only want to halve them). Stir the still-warm potatoes into the dressing and taste the salad for seasoning. Add more salt if necessary. Serve chilled or at room temperature. 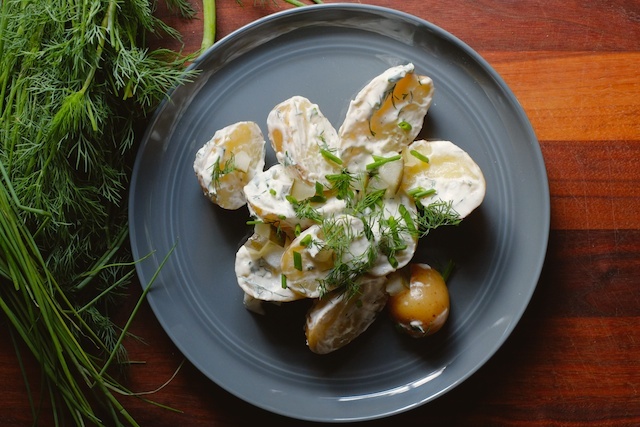 Love a good potato salad! Another thing you can do to boost the flavor is reserve a little bit of pickle juice (or use additional) and pour it over the piping-hot, just done potatoes. Give them a little toss and they will soak up the pickle juice in a big way. Sometimes I mix pickle juice and a bit of yellow mustard for this purpose, as well. Then when you mix the cooled potatoes into the dressing, you're hit with double flavor. Best tip I've ever received! Hey Emma! What a great idea! I always knew mixing warm potatoes with their dressing was the best way to get them to absorb flavor, but I love the idea of an extra hit of pickle juice on naked potatoes. It probably makes the layers of flavor a lot more interesting. I'm trying your tip next time!